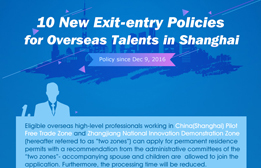 Shanghai has issued a notice on June 20, relaxing restrictions on work permits for foreign graduates to boost the city's talent pool. The new notice, issued by the Bureau of Human Resources and Social Security and the Administration of Foreign Experts Affairs, stipulates that four types of foreign graduates may apply for work permits directly. Previously, foreign graduates could only find jobs in the city if they had two years of work experience, or at least a master's degree. Foreign graduates from Shanghai universities need only a bachelor's degree if their future employers are headquartered in the China (Shanghai) Pilot Free Trade Zone (FTZ) or the Shanghai Zhangjiang National Innovation Demonstration Zone, according to the notice. Tyler Rhorick, an American student from New York University (NYU) Shanghai, has become the first person to obtain a work permit in China upon graduating with a bachelor's degree. He will be working at the NYU Shanghai Pudong campus.